Transform your weekly product team meeting into an engine for innovation and improvement with this meeting note template. Share updates on progress, key metrics, and anecdotes to gain an up-to-date, accurate understanding of current product endeavors. What milestones have we accomplished since our last product team meeting? What valuable lessons were learned? Have any issues or challenges come up since the last catch-up? How can we help solve them? Is there any other new information we should consider? Are there any new metrics, trends, customer feedback, or market influences we should be aware of? What's coming up? Moving forward, what features, releases, goals, or fixes are we focusing on? How are we planning to approach these? What were the main insights from this product team meeting? Include key decisions made, progress reports, and any opportunities, issues, or concerns that should be shared with key stakeholders. Clarify next steps, who's completing them, and when they should be done by. Note this information here to share and assign. The fate of a company is often determined by how well its product team works. But what makes a product team work well? Meetings. Teams who consistently hold effective meetings are much more likely to succeed. With our product team meeting template, you can turn your weekly catch-ups into an engine for improvement and innovation. Our product team meeting template functions as a flexible framework for you to adapt to your needs. It lets you get a high-level overview of progress as well a deeper understanding of important details. Whether you're focusing on OKRs, generating ideas for solutions, or analyzing customer feedback, simply customize this outline to attain a clear vision and strategy for what matters most. Healthy communication is crucial to catalyzing collaboration. But for product team meetings, it can be difficult to digest all the information exchanged. With this meeting note template, you can centralize and share insights from your product team meeting so anyone (even those not in the room) can get caught up to speed and contribute. Of course, the point of any meeting is to make progress toward a desired goal. No matter how many insights you have, they are nothing without action. 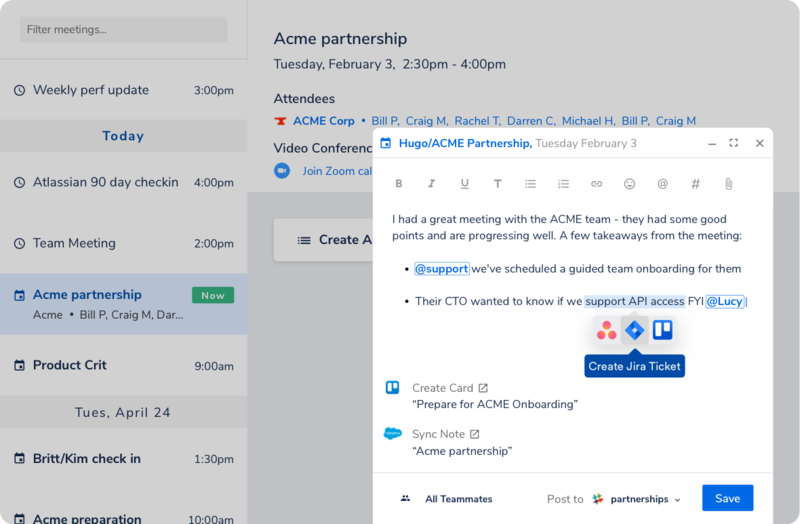 This outline integrates with your favorite tech workflow tools and allows you to create actionable items right from the meeting. It's never been this easy to transform insight into action before. The results you get from your team are the product of your meetings. With this template, you can streamline unparalleled success.